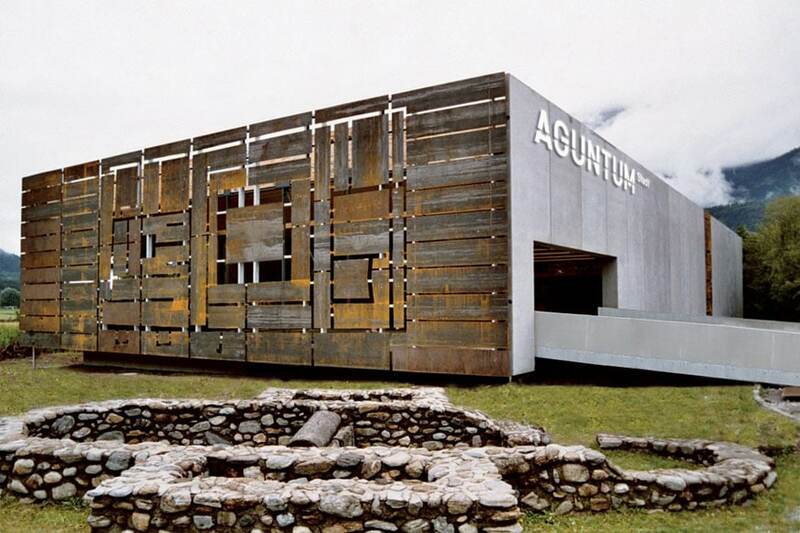 The Aguntum museum is an archaeological museum near the town of Lienz, Austrian Tyrol, located in the Roman site with the same name, one of the largest discovered north of the Alps. The excavation uncovered a portion of an important Roman town (a municipium) with structures, dating from the 1st to the 4th century B.C., which include the ruins of a beautifully preserved house, the baths, some warehouses, a market, a portion of the city walls, and the forum. The modern museum, completed in 2005 after a design by architects Thomas Moser & Werner Kleon, encompasses, along with the excavation site, two main rectangular buildings, one accommodating a permanent exhibition – displaying statues, glasses, ceramics, coins, bronzes, reconstructions, and scale models – and a smaller building, called “Atrium House”, which protects the remains of a large Roman villa. The Aguntum museum organizes guided tours and workshops for kids (in German).